In 2020, the United Nations will convene representatives from 190 countries in China to renew their commitment to nature. The success of the U.N. biodiversity accord is critical given the current state of the natural world. The WWF reports that humanity has wiped out 60% of vertebrate animal species since 1970. Research has also documented an alarming decline of invertebrates, the so-called “insect apocalypse”. These and many other losses reverberate globally, yet result in limited policy change and receive little attention from the media. A movement is growing, calling for a New Deal for Nature and People, to inject a sense of urgency into the political decision-making process. This global effort is mobilizing civic support for urban wild places to drive momentum towards the 2020 U.N. accord. Showcasing the nature that lives where we live – in cities – allows us all to take part and make a difference. By weaving nature into our everyday lives, we are creating equitable access to wildness and building social capital through community engagement, programming solutions, and neighborhood-scale designs. In short - we need an international spectacle to ignite a grassroots nature movement. Our solution is PopUP Forest, a collective of temporary nature installations celebrating local biodiversity through a blend of science and art. When activated in cities around the world, PopUP Forests will create a groundswell of support and media attention, creating a “Paris moment” for the U.N. biodiversity summit. Afterwards, pieces of the PopUPs live on. Its wildflowers, ferns and shrubs cultivate outdoor classrooms for school children in low-income neighbourhoods. They can also transform street tree pits. Planting native species will keep them abuzz with wildlife to delight children and nurture a sense of place. Installed on every block throughout the city, these biomes will provide connective habitats for birds, bees, and butterflies while engaging neighbors with slivers of wildness and each other. These green spaces also provide multiple health and well-being benefits that contribute to resiliency and reduce our carbon footprint. 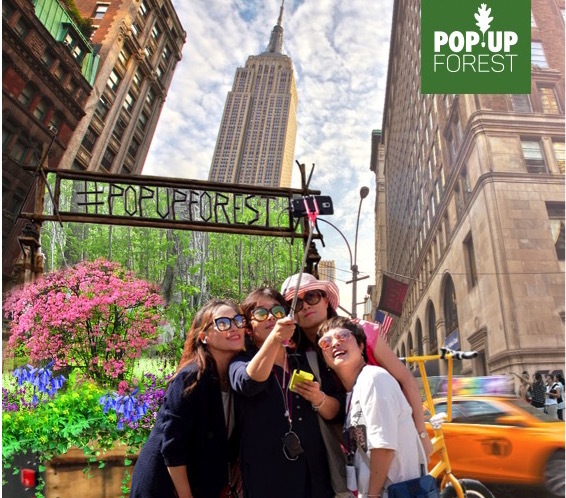 As example, New York City launched a mobile PopUP Forest in May 2018. This bicycle woodland journeyed from Brooklyn to Times Square and brought nature directly to New Yorkers. It offered green selfies, kids in costumes as extinct species, and free wildflowers to plant at home. Urbanites saw themselves - and their city - in nature. This model will be used to replicate and scale similar efforts in other cities around the world, connecting community to nature and promoting local policy initiatives. These global PopUP Forests (or PopUP Fynbos or Savanna, etc.) will differ from city to city, reflecting the communities they represent. Our team will guide and support participants through our framework for activation and engagement with local government, citizens, and organizations. With planning currently underway, activations run from January through December 2020 in cities big and small. Engagement period runs through June 2023. Join us! Let us know how you think a PopUP Forest could best help your organization build community around nature! Sign up with your email for forest fresh updates.